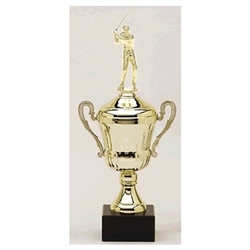 Golf Cup Trophies with Figure are available in your choice of color, size, and choice of male or female figure. Each Golf Trophy Cup is made of metal, the base in genuine marble, and the figures are plastic. We ship figure unattached. You insert once you receive. Finished sizes with golf figures are approximately 14" for small cup, 15.5" for medium cup, and 17" for the large cup. Item Size 14", 15.5", or 17"